A family-run Coventry firm that provides engineering and containment solutions for the automotive industry is pushing forward with ambitious growth plans. CK Quality has been working in partnership with a number of companies in the sector for more than a decade, but the firm is looking to the future. First started in 2004 by Patrick Herbert, CK Quality is now run by his sons Patrick, Craig, Karl, Paul and a management team that has 120 years’ experience between them. Their vision is to become the first-choice provider of quality support services to the automotive and non-automotive industries. With that in mind the team, which is based at the University of Warwick Science Park’s Business Innovation Centre in Binley, has been looking at ways of expanding. They have already taken more office space in the Binley-based centre to accommodate their growing operational management team which are dealing with big name partners not only in the UK, but across the globe. To accommodate this upward surge in business, CK Quality has also bolstered its team by adding 70 new employees to its ranks. Patrick Herbert, senior operations leader at the firm, said: “We have made significant investment into the company and workforce as we get stronger and push forward with our expansion plans. “This comes after seeing a number of brands, both within the UK and across the world, become part of the CK Quality family and we strive to provide the highest quality service. “Working with brands around the world has led to the expansion of our office space with the Business Innovation Centre and we couldn’t have done any of this without the support of the team at the site. 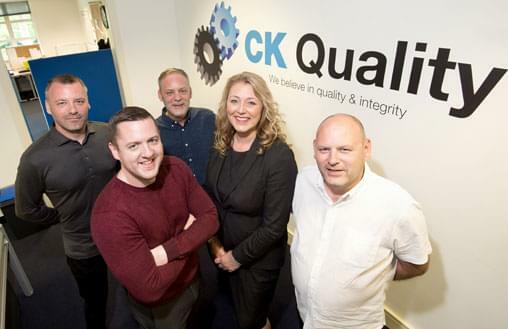 But all the hard work does not stop there as the plan is that CK Quality will also expand its services to include specialist quality recruitment, quality system conformance auditing and more. Jane Talbot, of the University of Warwick Science Park’s Business Innovation Centre in Binley, helped the company move into the office and will assist with its expansion. She said: “CK Quality has been a welcome addition to the University of Warwick Science Park and we’re so pleased that they have been able to expand. “The Business Innovation Centre is a supportive environment that allows businesses to grow and expand, so we are thrilled with the progression that CK Quality has made.